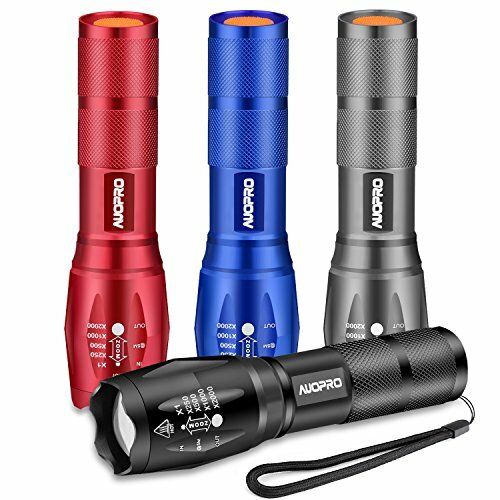 Keep this four pack of AUOPRO portable LED torches on hand so you never get caught in the dark. These compact high lumen everyday carry flash lights are small enough to store in your kitchen drawer, car glove compartment, purse or pocket, and they broadcast a beam of light up to 600 feet allowing you see clearly what lies ahead. It is wise to buy a few to keep all over the place in the house for unexpected needs, such as blackouts, power outages, hurricanes or even break-ins. Shines brightly. Provides powerful illumination to light the way. High, Medium, Low, Strobe and SOS modes allow you to choose the ideal setting. Easy to broaden the light to see all around or concentrate it into a fine beam to point to where you are looking. Makes the flashlight easy to operate. Fully press the switch to turn on/off the light, half press the switch to cycle through modes. Durable aluminum and shock-resistance body withstands rough handling. IP65-rated water resistance designed for use in rainy days. Sikp-proof design body enables a firm grasp, a lanyard to put on wrist to avoid dropping and helps keep the light handy. Weighs 4.4 ounces, 4.9" in length when closed and 5.7" when extended; Diameter is 1.3" (widest point) and 1" (thinnest point). If you turn off the light and wait a few seconds, it will reset to High mode. If you turn it back on immediately, it will go to the next setting. If you have any questions about this product by AUOPRO, contact us by completing and submitting the form below. If you are looking for a specif part number, please include it with your message.